I will also never forget the day when we buried my sweet boy, my oldest son. If I live to be a very old lady and forget everything else, I will never forget when the general handed me the folded flag that had lain on Casey’s coffin, as his brother and sisters, standing behind me, sobbed. I think of Casey every day. I waited outside President Bush’s ranch in Crawford, Texas, for nearly a month, determined to meet with him. And I want to let him know that millions of Americans believe that the best thing we can do—for our own security, for our soldiers and for the Iraqi people—is to bring the U.S. troops home from Iraq now. 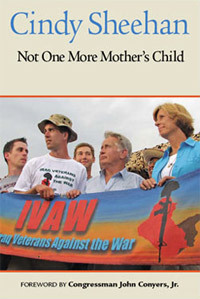 Just because it’s too late for Casey and the Sheehan family, why would we want another innocent life taken in the name of this ever-changing and unwinnable mission in Iraq? I did get to meet with President Bush two-and-a-half months after my son was killed, but I never got to say any of these things to him. I was in deep shock and grief at the time, and all I wanted to do was to show him pictures of Casey and tell him what a wonderful man our son was. But today things are very different. My shock has worn off, and now I’ve got a lot of anger along with my grief. I’m angry because every reason the Bush administration gave for the invasion of Iraq has been shown to be false. The September 11 Commission Report concluded there was no link between Iraq and the September 11, 2001, attacks. From the Downing Street Memo, we learned that the Bush administration “fixed’” intelligence to justify the Iraq invasion. And after every supposed milestone in Iraq—the capture of Saddam Hussein, the transition to Iraqi rule, and most recently the Iraq election—things just don’t get better. U.S. soldiers and Iraqis continue to be killed in greater and greater numbers, the cost of the war skyrockets, and there’s no end in sight. After thirty U.S. service members were killed in late July 2005, the president reiterated his pledge to complete the mission of our fallen soldiers. But that mission originally was to protect the United States from a lethal attack by Saddam Hussein—with weapons it turns out he did not have. I don’t want the president to use Casey’s memory to justify continuing this war, which will end up only needlessly killing more wonderful young men like him. Thousands of people streamed into Crawford to support my vigil and persuade the president to listen to the people who want an end to this war. We camped out in a drainage ditch, in 100-degree weather, but it was worth it. If and when I do meet with the president, it will be for all of the Gold Star Families for Peace who lost children in this war, for all of the mothers and fathers and husbands and wives who are grieving and who want to tell the president to end this devastating war. No one else—not one more mom—should have to lose her son in Iraq.